And made a start on my new journal using it alternately as a mask and stencil. And because I had masks enough, i used on the page. I used the distress inks for coloring. And Michelle, those are not sixty five roses, BUT they go along with some new good thoughts and prayers for your sister Shannon! If you have no idea what I am talking about, read Michelle’s post and leave a message, I know she appreciates it VERY much! For those of you who read my last post and made a try with the ‘ACRYLIC INSTEAD OF MICAMAGIC INK’ I was not completely happy with the results. There should be more white visible. 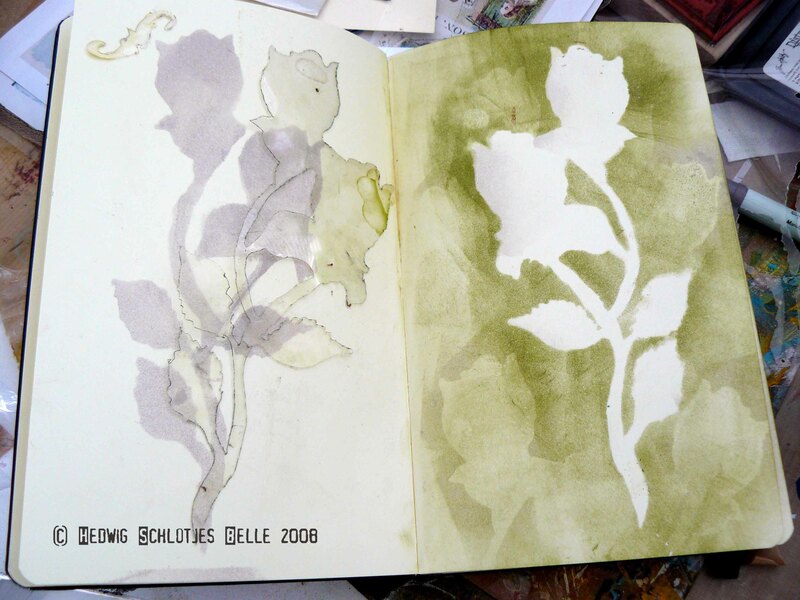 I tried several different papers, but the paint was absorbed to quickly by the paper. AHA: the resolution is to make a ground with gel medium. 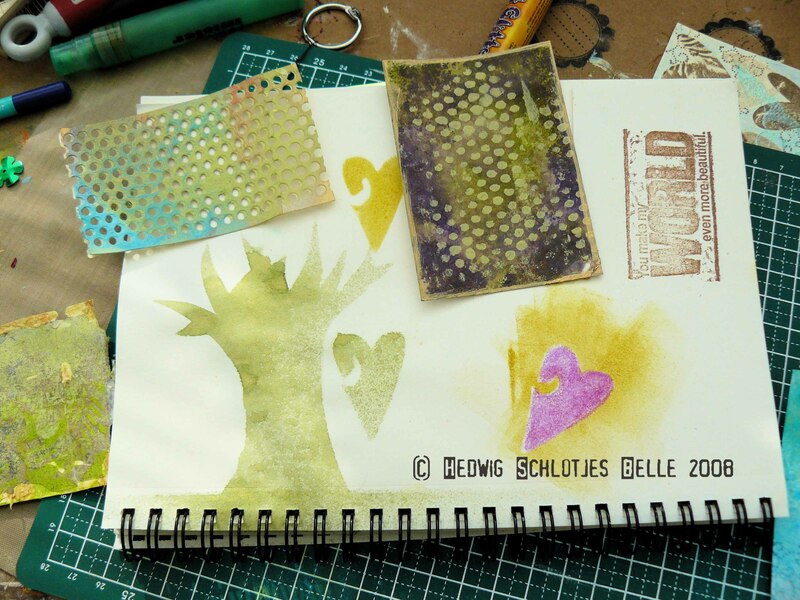 Let the gel medium dry, then spread some colours acrylic with a brayer (a metallic looks GREAT) and then use a stamp that you push into the paint and then move a little bit. I would like to show you the difference, but made already something of it that is in the mail. Maybe next time!! Michelles new Crusade is stenciling. Well, I was still busy carving stamps *GRIN*. 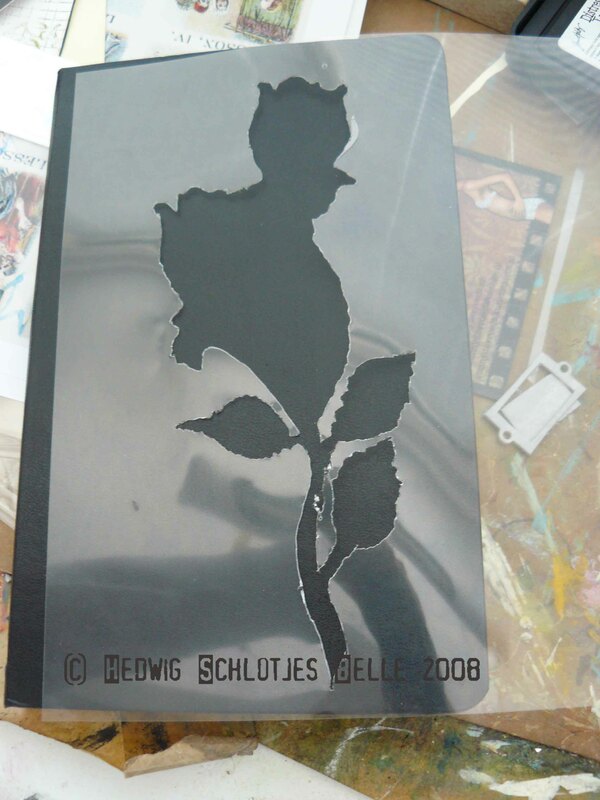 Besides, I would LOVE to have a stenciling burner, but that’s not available here in Holland. And it has to be appropiate for European standards (I’ve found one, but the costs of the shipping are higher than the whole burner ;-(( And cutting into plastic… It did not attract me (like a nail scratching on a black board, that feelin’). 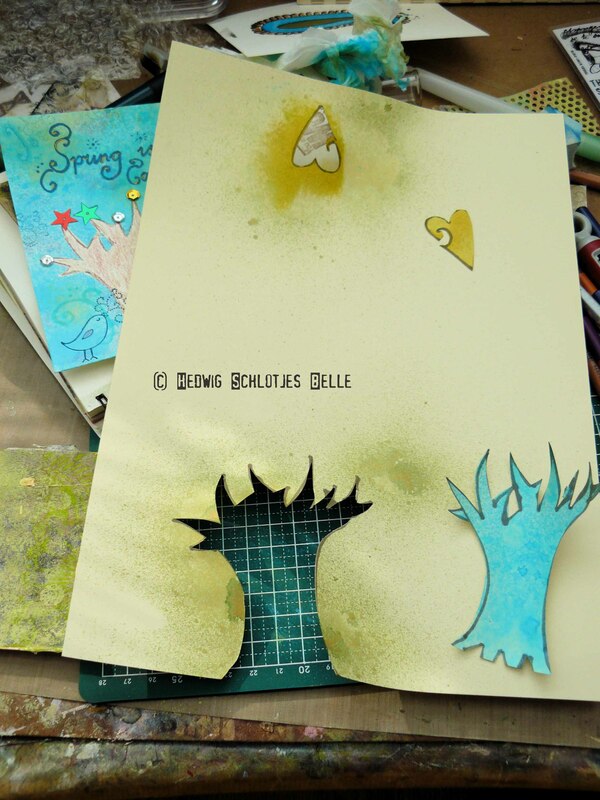 Actually, I use stencils a lot, so making your own IS TEMPTING! Because of the missing feet, I used the mask for this card. Sprayed it with glimmermist. 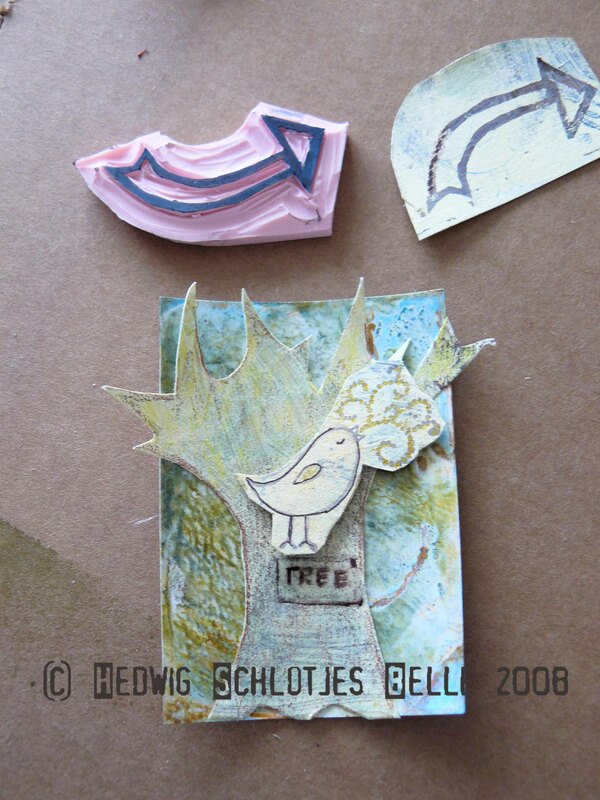 Also made an ATC with the stencil. (Guess I am into birds and trees lately). And carved an arrow (for me this speedy ball works better than the other one (white). Easier to make more details in the stamp. Okay, that was a good start for me. 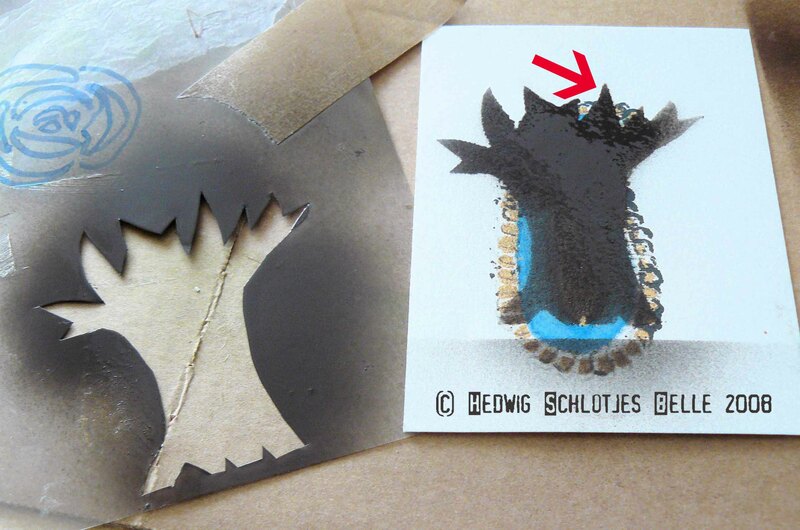 Because of the curling of the paper (not so handy for a stencil ;-)) thought i could TRY a plastic sheet. A good sharp knife makes half the work. And it felt less uncomfortable cutting it than I thought it would be). If you look well, you can see the spray paint is still wet, HAHA. 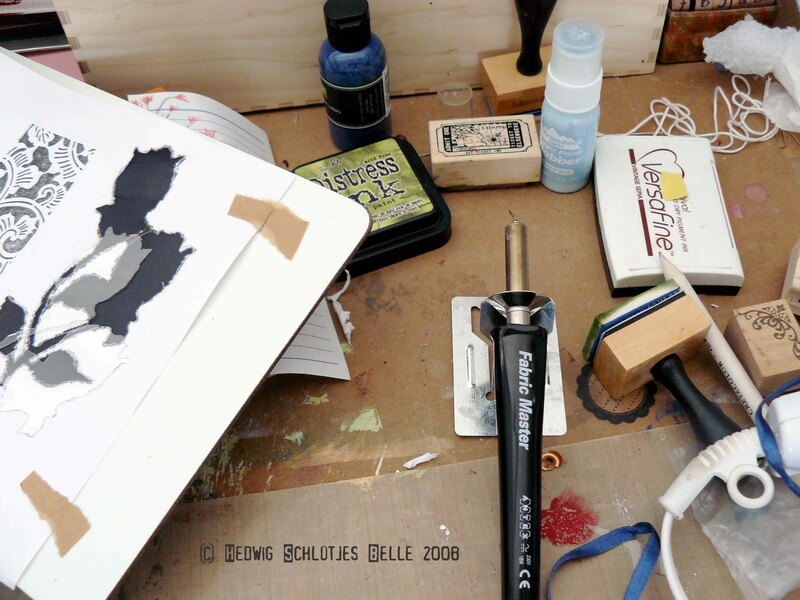 Okay that was it for stenciling (and home made stamps). This weekend I attended a show in Holland were Judi from Judikins was demoing. 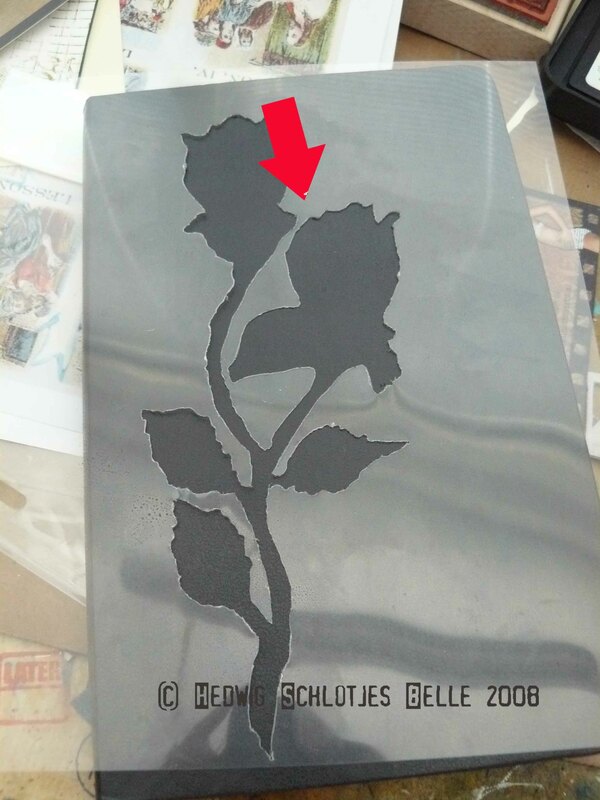 She brayered a glossy paper with mica magic and did stamping in it, whilst moving it just a little bit on the paper (push the stamp with power on the paper and then move for 2mm or so). Gives great effect. Unfortunatly the micamagic was not available anymore in the colors I wanted. 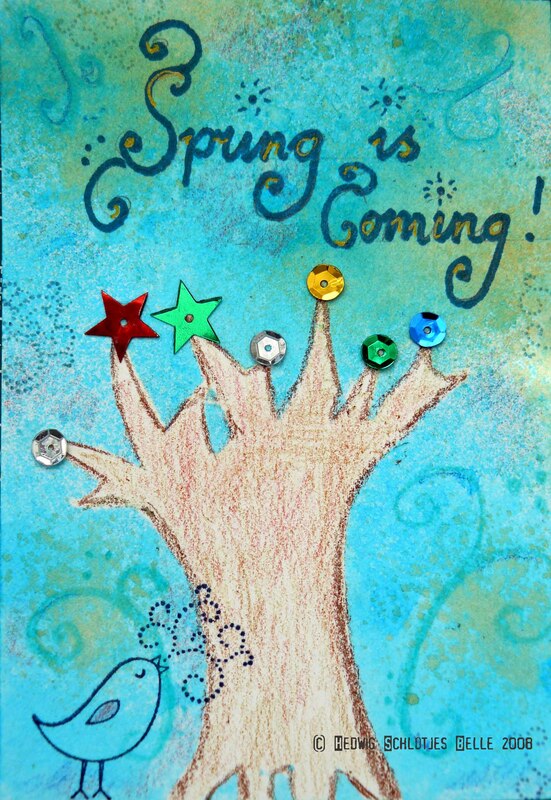 At home I gave it a try with acrylic paints. 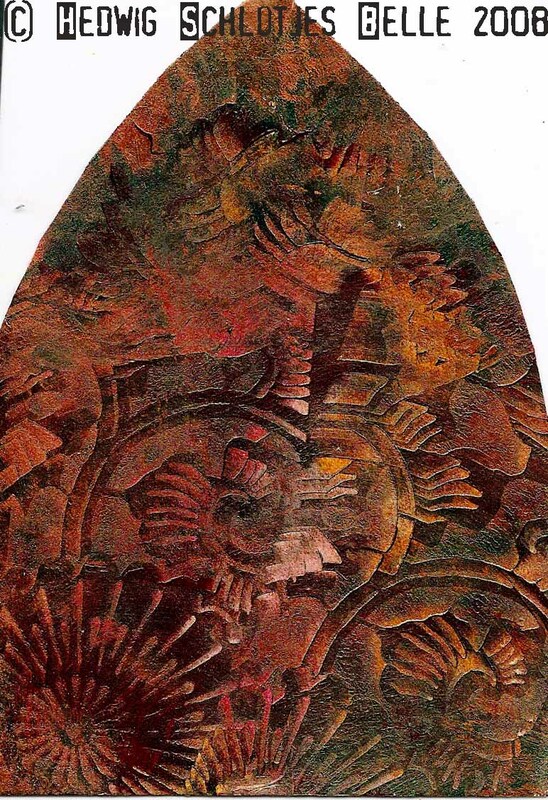 I used bronze (Reeves) and quinacrodon red and turquois (golden). Looks great, doesn’t it? Lesson of this all: you can always try to work with what’s on hands. But too: working with another material can give different results.